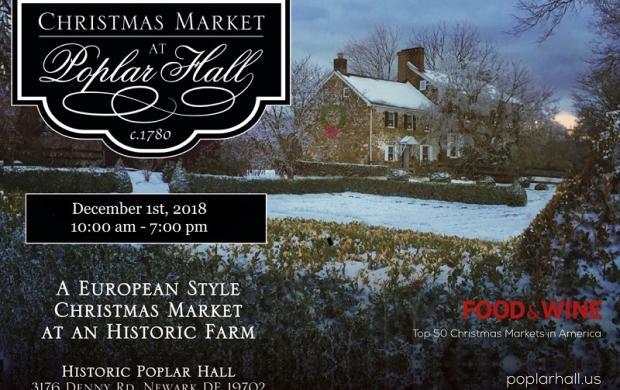 The restored 18th Century Poplar Hall will be turned into a European style Christmas Market on Dec. 1. The market will be a completely unique experience and one of the only markets of its kind in the area. Purchase one of a kind handcrafted gifts from 35+ different artisans among festive Christmas decorations. Visitors are encouraged to walk the property and watch artisan demonstrations. Meet chef Walter Staib, owner of the City Tavern Restaurant and host of “A Taste of History”. There will be a set of vintage British sports cars and vintage British motorcycles from the 50’s and 60’s and live music. A lighting ceremony will end the special night.